When it comes to first class experiences, Virgin Atlantic have one of the best with their Upper Class service, and it’s about to get even better! The new Virgin Atlantic Upper Class product being rolled out on their Airbus A350. Ready to be experienced when they take delivery of 4 new aircraft in 2019, the cabin features a redesign of their seats to the new Upper Class Suites. Couple this innovation with an excellent reputation for high levels of service and comfort, Virgin Atlantic Upper Class ensures you get to your destination in style. From the moment you leave your house, until you get to your destination airport, everything is taken care of, so you can sit back and relax. Flying with Virgin Atlantic Upper Class makes travelling a real pleasure! The experience begins at the booking stage with extras that other airlines charge for, through to after you arrive with priority service for your luggage. 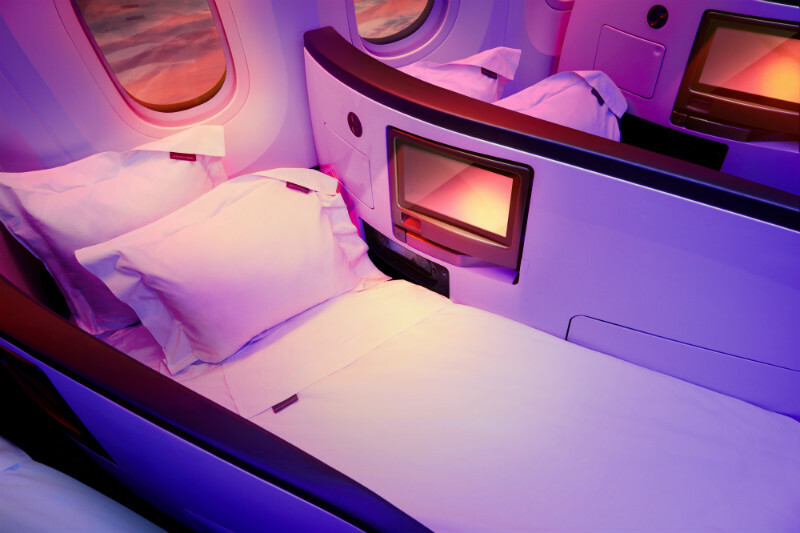 Virgin Atlantic Upper Class will ensure you arrive with that well-rested feeling. Everyone has individual needs when flying, so Virgin Atlantic allow passengers to choose their seats free of charge, which we can of course allocate for you.  Before you’ve left your home or office, and after you’ve flown, the unbeatable service from the best airline for business travel does not stop there. Virgin Atlantic offers a chauffeur service to get you to and from the airport, so the whole journey is relaxing and stress-free. With fast-track through security from the dedicated Upper Class check-in, and access to the Virgin Clubhouse Lounge with complimentary spa treatments, meals and beverages, business class flights with Virgin Atlantic offer an executive experience. A brand new Upper Class experience on the Virgin Atlantic A350s is providing business class passengers with a spectacular new start and end to their flights. 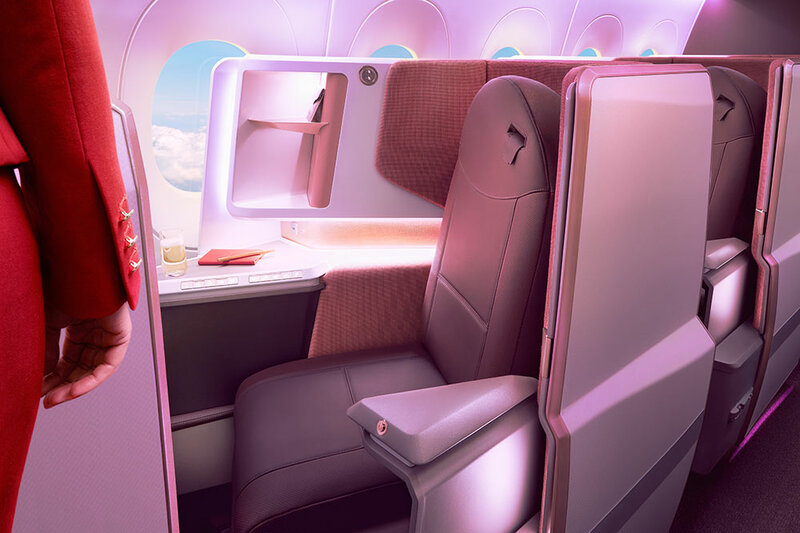 With a 1-2-1 configuration, Virgin business class passengers still receive direct aisle access from all their Upper Class seats, but with the new design, all the seats are forward facing meaning more privacy and better views for window seats. To increase privacy further, the introduction of privacy screens coupled with higher seat walls means an experience closer to first class than ever before. Along with privacy, Virgin focuses on convenience and entertainment in their new Upper Class cabin. With a cocktail table, shelving, and larger tray table, passengers will never be short on space for their belongings while still having them at their fingertips. The new inflight entertainment system features an 18.5 inch screen and passengers can connect to the system via either Bluetooth or Wi-Fi depending on where they are onboard. The innovative social area known as The Loft creates a place to chat with friends and colleagues over a drink or meal, or just relax and watch the 32 inch screen. 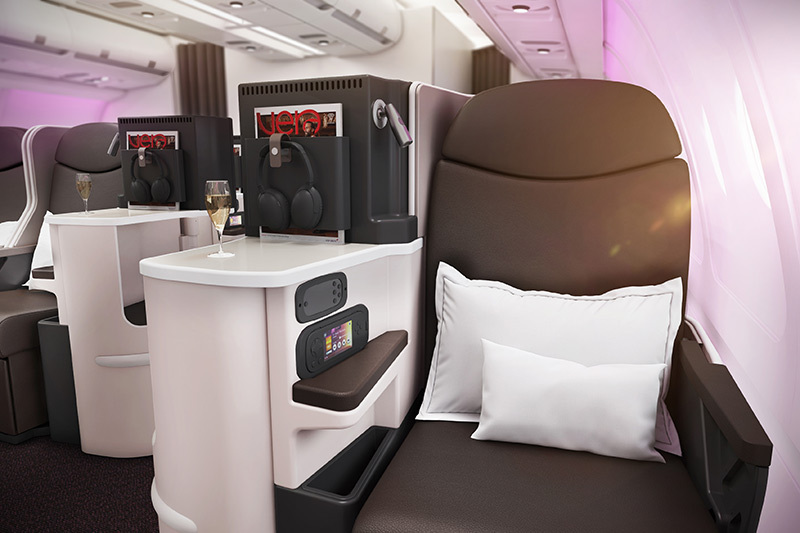 The new Airbus A350 Upper Class experience with Virgin Atlantic continues to offer all the things that their current service offers, with champagne on arrival, fully flat beds, an award-winning dining experience, and in seat power supply by both plug and USB. With the fully refitted Airbus A330-200s, Upper Class passengers benefit from a staggered 1-2-1 configuration that provides exceptional space and comfort. All forward facing and direct aisle access to all seats, the Upper Class seating reclines into a fully flat bed for a comfortable night’s sleep. With all the benefits of Virgin Atlantic Upper Class available on this flight including a superb choice of entertainment, a-la-carte dining menu, and luxury amenities, the A330-200 is now a joy to experience. The unique reverse herringbone design of these Virgin Atlantic Upper Class cabins was revolutionary when released and continues to offer passengers a fantastic business class experience. With each seat having direct aisle access in either a 1-1-1 or 1-1 configuration, the Upper Class seat can be made so that couples can dine together on the same table, and convert into a lie flat bed up to 6 ft 7.5 inches. Combined with the in flight service that Virgin Upper Class has built a reputation around and an onboard bar area to enjoy a delicious drink while chatting with others, these aircraft will ensure that you arrive in your destination refreshed and relaxed. Upper Class is designed to make life easier, and this means all the stressful parts of flying have been taken care of. The Virgin Atlantic chauffeur service means there’s no last-minute dash to the airport, and fast-track security lets you cut the queue. 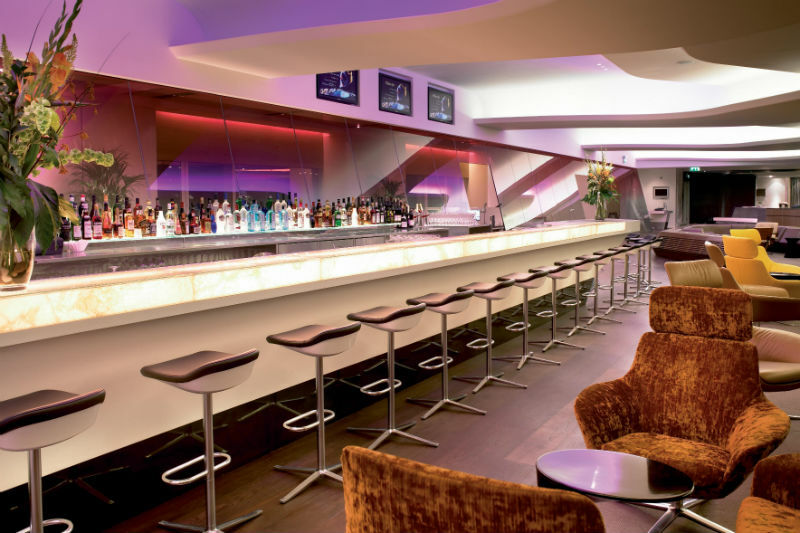 If you’ve arrived early, you can enjoy the clubhouse with lots of little extras, so once you step into Virgin Atlantic Upper Class you’re already relaxed and ready to enjoy the experience. Just Fly Business can take care of the booking and any extras, so you just need to think about what to pack. When you travel Virgin business class, you can feel confident that you’ll never be left hungry for nourishing, delicious food. On Virgin first class flights, you don’t eat microwaved dishes delivered in a rectangle box – you get a broad range of meals served by professional chefs. Thanks to boasting dishes from across the world, you’ll find all your favourites on the menu while enjoying your Virgin Atlantic Upper Class experience. If you have any special dietary requirements, such as if you’re a vegetarian, have allergies or require Halal meat, then you can trust us to make all the necessary arrangements beforehand, meaning we really can handle every aspect of booking your Virgin Atlantic first class flight. Learn more about what makes Virgin first class flights so special by calling our luxury travel experts today. If you’ve got an important meeting coming up, don’t turn up at your destination looking frazzled. Instead of separating Virgin Business Class and First Class, Virgin Upper Class includes all the essentials that business travellers need, creating a single premium class. Just Fly Business can get you the best deal on Virgin Atlantic Upper Class, allowing you to enjoy the highest level of service without the price tag. Business travellers will love the in-flight WiFi and power points, so you can get some work done on the go, and the fully-flat beds mean you can get some rest, so you don’t arrive feeling jet lagged. Those who travel Upper Class will also get priority when it’s time for disembarking, and are the first to collect their luggage, meaning Virgin business flights help you get to your meeting on time. Just Fly Business can also arrange for a luxury transfer at the other end, whisking you to your destination in style. Home to dozens of theme parks, water rides and animal exhibits this magical city is not just for the young, but for the young at heart. As well as the well-known roller coasters and rides, Orlando offers many charming experiences to make it a holiday to remember. 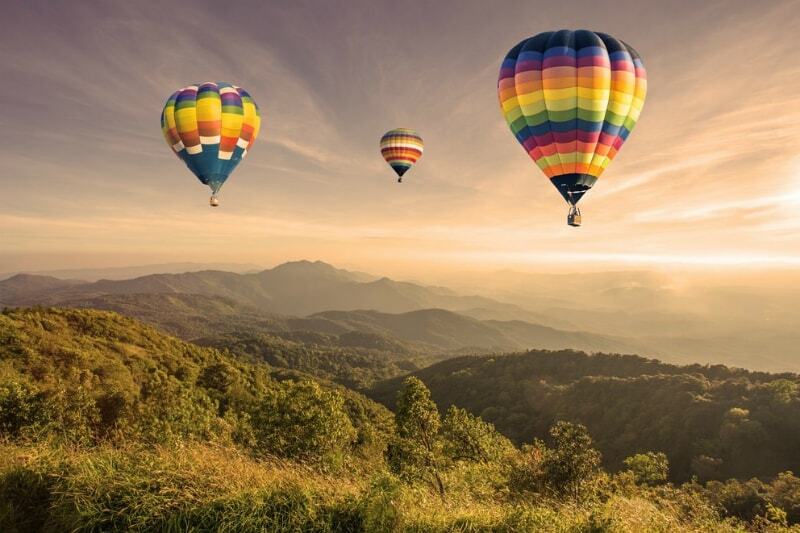 Take a leap into the unknown and take a hot-air balloon ride, go indoor skydiving or even go parasailing for the day! Get encaptured under Miami’s spell of glamour and chic with cheap business class flights with Virgin Atlantic. 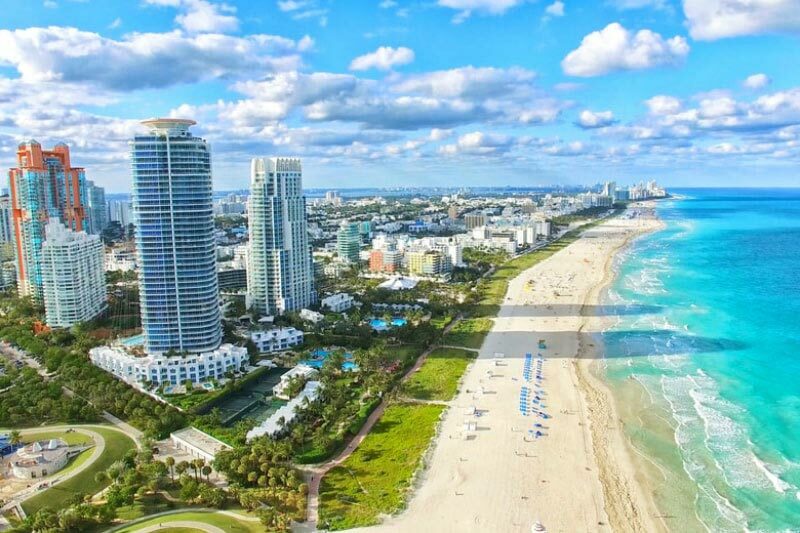 The beauty of Miami greets you on the doorstep with its crisp blue sky and breath-taking beaches. The inhabitants of Miami do not disappoint, expect bronzed bodies, high heels and designer sunglasses! 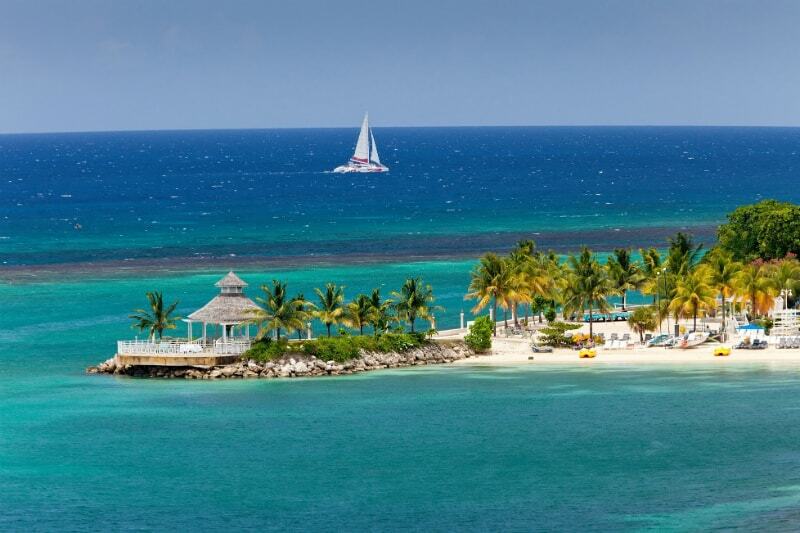 Once you’ve discovered the Caribbean paradise, you can’t forget it! When picturing the tropical islands, you think of clear turquoise seas, incredible sun, exotic palm trees and soft white sand. That is exactly what the Caribbean is, and more. As well as the perfect escape for calm and serenity, Jamaica‘s enchanting atmosphere will take you away with the infectious party and fun-loving spirit. Famous for moreish rum punch and easy listening reggae music, you’ll find yourself unable to escape from the relaxed demeanour of the island and everyone on it. Prepare your senses and explore the cultural delights of Delhi, India with Upper Class flights on Virgin Atlantic. 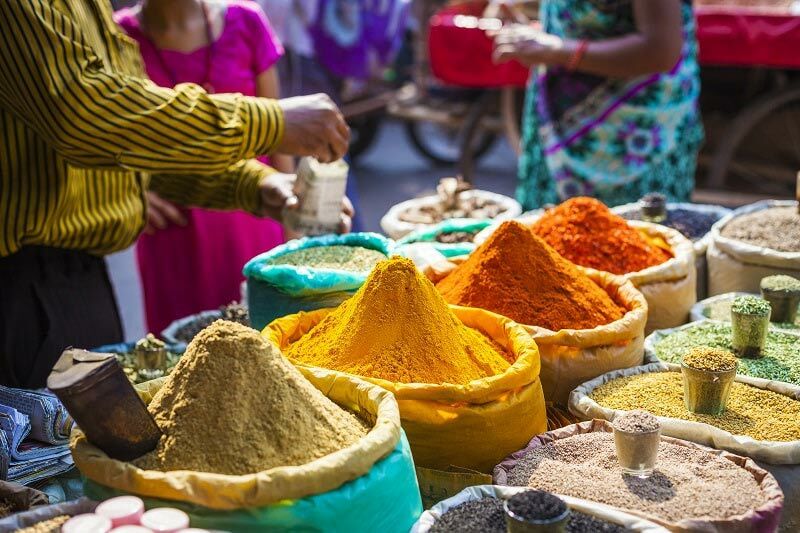 The sights of the Red Fort, the smell of spices, the feel of the humidity, the taste of the cuisine, and the sound of the streets, this city is overwhelming in the best way possible! For the best deals on Virgin Atlantic Upper Class, simply call Just Fly Business today. Call our team on 0208 417 1366 or fill in our online enquiry form, and we can get the best price for your flights.